Firstly let me introduce myself, my name is Paul and together with my wife Karen we run Your Pest Control. You can be assured that when you call any of our numbers you will be talking to one of the owners, not somebody working in a call centre. Consequently, you will receive a great customer service. Personally, I am CRB/DBS checked. This means you can have complete confidence in my integrity and honesty when I attend your premises. 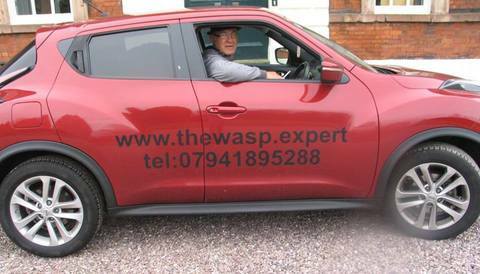 If you are elderly, vulnerable or a woman living on her own you can rest assured I am the person you are looking for to deal with your pest problem. Furthermore, Your Pest Control is dedicated to giving you a top quality pest control service at an affordable price. In addition, all work is guaranteed and carried out in a professional and timely manner. Phone: Landline 01257 412 197, Freephone 0800 772 3363, Paul on 0794 189 5288 or Karen on 07730 455 462. A fully trained and insured technician will visit your premises who will inject a small amount of insecticide into the nest to eliminate it. Tree Bumblebees can be quite aggressive in defense of the nest. Commonly seen dancing and swirling around the entrance to the nest. This is the typical price to eliminate fleas from a 2 bedroomed, terraced house. A fully trained technician will visit your premises and treat the affected area with a gel designed to kill the ants' nest. Swarms of bees will be collected and re-homed with a local Bee-Keeper wherever possible. During the summer of 2016 channel 4 contacted me and asked me to treat a wasp nest in the ground. The channel 4 TV programme was “Selling Houses With Amanda Lamb”. A video can be found here Wasp Nest Video. The filming took place in Frodsham opposite the Cheshire Cheese pub and took over two hours. An interesting experience as I have never appeared on the television before. On a rainy Wednesday night in August filming took place. Consequently, the wasps were not particularly active due to weather. Still, you have to treat the nest with respect irrespective of the weather. If the service you require isn't listed above, please go to our contact page for a free quote.